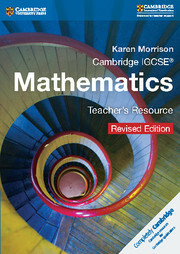 This Teacher's Resource CD-ROM is packed full of practical support ideas and advice, as well as extension activities and discussion points to bring maths to life. 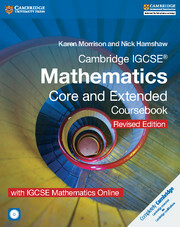 It is designed to work alongside the Coursebook and Practice Books, completing the suite of Cambridge IGCSE® Mathematics material. This resource includes planning advice for setting up and running the Cambridge IGCSE Mathematics syllabus, as well as teaching notes, which include ideas for introducing each topic, whilst putting maths into context and into a real-world setting. 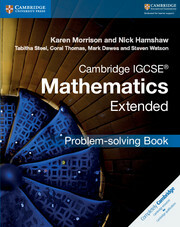 Ideas for extension material and how to identify common mistakes and misconceptions are also included. Answers to questions in the Practice Books and Coursebook are provided and have been updated to match the content of the revised coursebook. New and experienced teachers alike will find that the ideas and advice on how to approach topics will help in the organisation and planning of teaching and the supporting of students to achieve their potential. Checklists for each chapter to separate out Core and Extended topics. Starter questions for each chapter to help introduce topics. Chapter notes provide a guide to what to consider when teaching each chapter. Answers to exercises in the Coursebook and both Practice Books for easy reference. Breakdown of the syllabus by book topic. Answers to exam-style questions in the Coursebook - in numeric and worked formats.